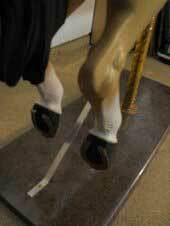 This carousel horse measures 42" X 52" and is mounted on a stand with a brass pole; it's from a three-row carousel from Wisconsin Dells, Wisconsin. 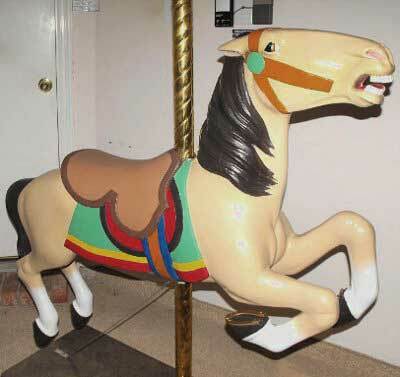 Only two carousels were made with these large outside row horses (this is one of three I own). 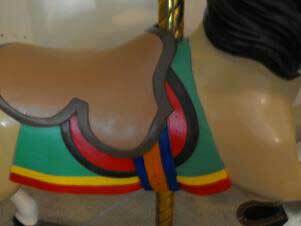 These carousel horses are all wooden and have been professionally restored. They were bought originally from the Wisconsin Dells amusement park by a collector in Oklahoma City in about 1983.